Hello Alliance Members. At virtually all RIGEA events, I try to hand out some map resources. 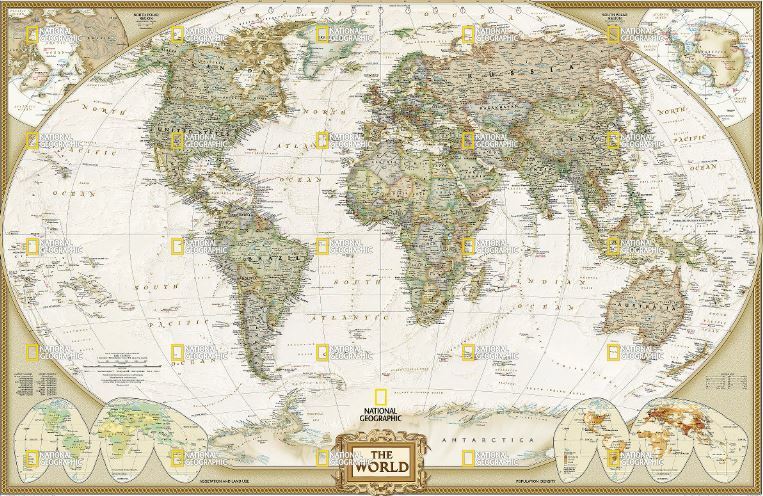 Soon I will have enough of the World Explorer/World Satellite maps to give every RI teacher a CLASS SET of them (pictured below) as well as a large number of wall maps. This is the perfect size for 4 students to put their desks together and work on any number of spatial projects. Any teacher that recruits a new RIGEA member (or is a new RIGEA member) can have a class set at our next event (I believe this would be a great way to kick off Geography Awareness Week). There are some maps that the alliance has that we can’t give out to on a large scale, but are certainly available to any RIGEA member that would like to borrow them. I have several that are available on a “first come first serve” basis, but I will always retain a few to circulate around the state. I will put the dimensions and a picture some of these maps below. If you would like to borrow any of them for an extended period of time, send me email at rigea@ric.edu and sdixon@ric.edu with the subject title “RIGEA maps on loan: [map title]” and we’ll try to make arrangements so you can use these in the classroom.